The time of year has arrived where we find ourselves beginning our search for that perfect Christmas day outfit and any dresses we need for occasions leading up to the big day. Personally I have three or four events that I need outfits for this year, so to say I'm already starting to stress a little is an understatement. Luckily, the shops on the High Street seem to be getting all of their party wear in stock already, so I've been able to get some ideas and inspiration with plenty of time to spare. There are a few shops I always go to first, and find never let me down when it comes to looking for something a bit fancier or dressier, and this year, so far, it's been Coast who have impressed me the most. I don't go out much anymore, I'm more of a night in with a film kind of girl, so when I do go out, I like to make an effort. I want to feel my best, wear something which compliments me and makes me look good and therefore don't mind spending a little extra... This usually means that I'm getting a higher quality item too, and you're less likely to bump into someone wearing the same outfit - Oh how I dread that happening! I'm trying to avoid the OTT sequins this year, and focus more on velvets, deep colours and detailed sleeves, collars and hemlines for my party wear options. If you're still loving your sequins and sparkle though, fear not, they're well and truly back too. 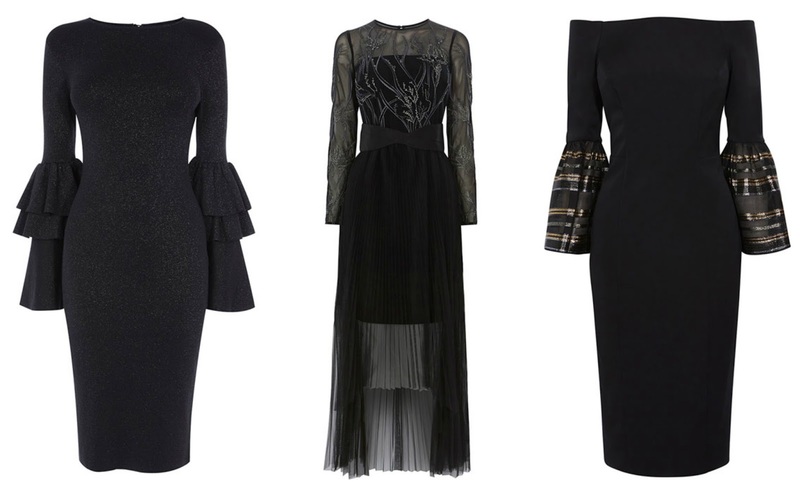 I'm lusting so badly over the dresses below... The styles are all so unique and they will guarantee that stand out from the crowd look, while staying classy and without being garish. The options of mixed fabrics, embellishments and metallic detailing are all really gorgeous, it's just difficult to make the decision of which to choose! Styling these with simple clutch bags and sparkly shoes will complete the look perfectly. I definitely think I'll be picking up one of these for Christmas and one for New Year too, then all I'll have left to worry about is what presents to buy for everyone else! Have you started sorting out your Christmas outfits yet, or are you too busy wondering what to buy everyone else first?